Finding the earliest galaxies is a bit like looking for a needle in a haystack, except the needle is virtually invisible and the haystack is the size of the universe. Scientists tend to like a challenge, though, and some intrepid astronomers have found one of the most distant galaxies to date. The best tool to study distant galaxies is the Lyman-alpha emission line, denoted as Lyα, a strong, easily observable line emitted at 1216 Å that is created by photons emitted from vast amount hydrogen in the galaxies. Lyα acts as a beacon to astronomers looking for the first galaxies that formed after the big bang. The authors of today’s paper have found the third-most distant, or highest redshift, galaxy by finding the galaxy’s Lyα emission. This galaxy has a redshift of z = 7.66. In other words, observing this galaxy is like looking back in time almost 13 billion years! Of course, finding such a high-redshift galaxy is no simple task. The first step the authors took in the hunt was to select an initial sample of galaxies. These galaxies were found in a region of the sky known as the Great Observatories Origins Deep Survey South (GOODS-S). This survey is comprised of observations with Hubble, Spitzer, Herschel, Chandra, and XMM-Newton, giving astronomers a view of this area of sky over wavelengths from the X-ray to the far infrared. Using the photometry from these observations allowed the authors to identify 12 galaxies with potentially high redshifts of z = 7 – 8. Armed with this sample of candidates, the authors went to the telescope to see which galaxies could be confirmed as one of the first galaxies. Using the Multi-Object Spectrometer For Infra-Red Exploration (MOSFIRE), which is located on the Keck 10-meter telescope on Mauna Kea, Hawaii, the authors basically stared at these galaxies for four nights, one of the deepest (or longest) observations done for z ~ 7 galaxies. The reason the authors looked in the infrared region of the spectrum for the ultraviolet 1216 Å Lyα emission line is because the galaxy is so distant that the line is redshifted into the IR range of the spectrum. In distant objects, the wavelengths at which emission lines are observed gets shifted towards the red end of the spectrum as the expansion of the universe causes a cosmological Doppler effect. This measurement resulted in the confirmation of a single galaxy out of the original sample, with significant emission detected at a wavelength of 10532 Å. The spectrum for this galaxy is shown in Figure 1, where the Lyα is outlines in red. Spectrum of a z = 7.66 galaxy with a Lyman-alpha emission line. The top panel is the 2D spectrum that results from the original exposure on the telescope, while the lower panel is the 1D spectrum in black, collapsed from the original 2D spectrum. The best fit line to the spectrum is shown in red. The gray shaded region at the very bottom of the plot is the sky spectrum, which denotes regions where the atmosphere blocks any emission that might be coming from the galaxy. The blue-boxed inset shows the individual detections for each of the 4 nights the object was observed. The most difficult part about identifying a Lyα emission line at these redshifts is making sure it is not actually a different emission line from a galaxy at a lower redshift. For example, doubly-ionized oxygen (denoted [O III]) emits an emission line at 5007 Å. If the emission line that is observed is actually from [O III], then the observed emission at 10532 Å could actually be a galaxy at a redshift of z = 1.10. How can this possibility be ruled out? The easiest way is if there are other emission lines that should be visible but are not. The authors ruled out [O III] by noting that there is another nearby hydrogen line, Hβ, that would be visible in the spectrum, as it should be redshifted along with the [O III] and other emission lines. Given that no other emission was detected at the expected wavelength of Hβ, this possibility was ruled out. 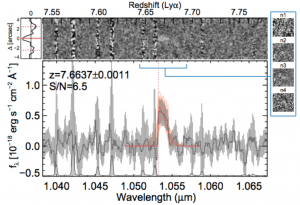 After pursuing other possibilities of contamination, the authors determined that Lyα emitted from a very high-redshift galaxy was the most likely explanation for the detected signal. In the future, finding more galaxies like the one in today’s paper will be extremely important, because only when there is a sufficiently large sample of galaxies from this cosmic era can astronomers begin to broadly understand how Lyα is emitted from galaxies at the earliest stages of galaxy evolution. Additionally, searching for Lyα emission from galaxies in the early universe can also say something about the reionization history of the universe (see more here, here, and here.) Astronomers are just beginning to broach these questions, and the authors of today’s paper have made a significant contribution to answering them. Good job, Joanna! I could understand it! !